There are three drivers in each of the tiny earpieces - two woofers and a tweeter. 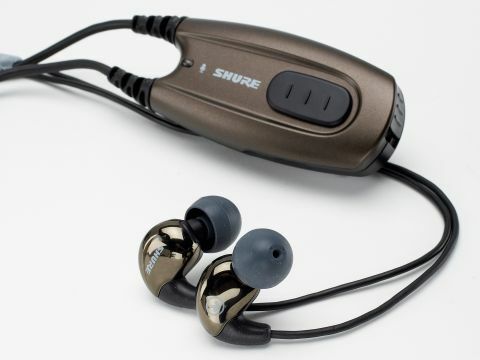 If you're looking for top-notch in-ears, try these - but don't overlook Shure's other models and Etymotic designs. These are almost certainly the world's most expensive earphones, and they're aimed at the portable audio market. But is compressed digital audio worth good-quality earphones? Given that the side-effects of compression are most marked through inferior transducers, we'd say 'yes', though arguably if you can stretch to these, you can afford a player with a big drive and the use of uncompressed audio. Apple Lossless through a big iPod is the obvious partnership for the Shure E500PTH. Shure has its justifications for the price, of course. First among these is the unique inclusion of three drivers in each of the tiny earpieces. Two woofers and one tweeter are somehow fitted in there, the sound being blended in the little pipe that opens into your ear canal. Various ear-fitting adaptors are supplied, the ideal pair for your ears not only improving sound quality but cutting out ambient sounds as well. Press a little button on the inline adaptor, though, and you are reconnected to the world via a microphone, while the music plays on, attenuated. Clever, given that removing and refitting the earpieces can be a bit of a performance. Obviously, the sound is a whole lot better than via giveaway alternatives, but we're not utterly convinced. Yes, detail is very good and treble is clearer than we've heard from the vast majority of in-ear devices, but bass, while clean and quite powerful in a rhythmic kind of way, lacks some of the extension we expect from the best conventional headphones.